Langdeshang Village, or Langde Upper Village, is an archetypal Miao village in Leishan County, Guizhou, located about 30 kilometres outside of Kaili City. It has become famous throughout China for its peaceful natural atmosphere, friendly locals and rich cultural heritage. There are only 500 villagers living in Langdeshang and all of them come from only ten different family lines. Although it is generally considered a small village, in many ways it is as impressive as the mega-cities of Beijing and Shanghai. The village has become like a museum, preserving ancient buildings and local customs that have been practised by the Miao for hundreds of years. Langdeshang’s popularity stems from the fact that the locals, with their bright smiles and kind eyes, are eager to share this cultural heritage with anyone who visits their village. 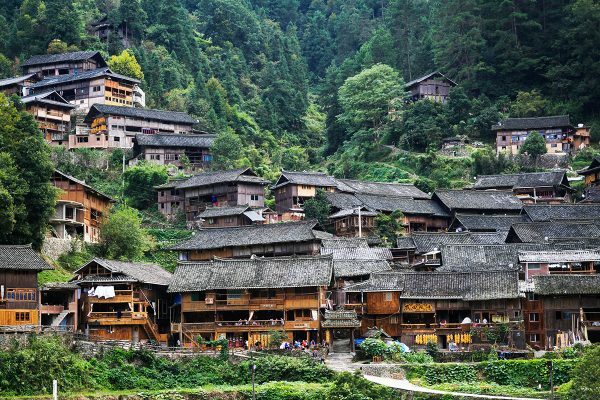 As Langdeshang is located at the foot of a mountain, the village is made up of Diaojiaolou, which are typical Miao buildings that are held up by wooden stilts and are between two to three storeys high. The front of the building is supported by pillars whilst the rear of the building is suspended on stilts that keep it level with the mountainside. These buildings are an architectural wonder, as oftentimes they have been built without the use of any nails or rivets. They are held together by means of a system of wooden joints, which lock together perfectly and give the structure stability. All of these Diaojiaolou will have been built by local carpenters and made from wood cut from the surrounding fir trees. The women in Langdeshang wear long skirts and so are often referred to as “long skirt Miao”. The village rests by a stream and is nestled deep within the mountains. The rich green grass, the gentle chirping of the birds and the soft rays of the sun setting over the hills come together to create a wonderfully soothing atmosphere. There are five “flower roads” that lead into the village and three wooden gatehouses, or village gates, at the northern, western and eastern entrances to the village. These roads are paved with smooth blue flagstones or rippling cobbles that, alongside the looming stilted houses, look incredibly picturesque. On arrival at Langdeshang, visitors will be greeted with a traditional welcoming ceremony. Beautiful young local girls will arrive, adorned in their traditional dress, and “block the way” of the village gate. Twelve tables will be set up in the middle of the path that leads into the village. At each table, the visitors will be met with two young locals in their traditional dress. These two locals will propose a toast and the visitors must drink two bowls of “block-the-way” wine. Once they’ve reached the final table, the toast will be made with a huge bull horn that has been filled with “block-the-way” wine. However, if you plan on visiting Langdeshang but don’t want to drink too much of this wine, there’s no need to worry! All you need to do is put your hands behind your back, bend forward a little, touch the cup with your lip, and say “dousemo”, which is the Miao word for “thank you”. That way you can pass the table and move on to the next one without having to drink any wine and without causing offence. The villagers are very friendly and will not make any visitors drink if they don’t want to. Once the toasts are complete, the villagers will set off firecrackers, play the mangtong, and sing the song called “Toasting the Guests”. 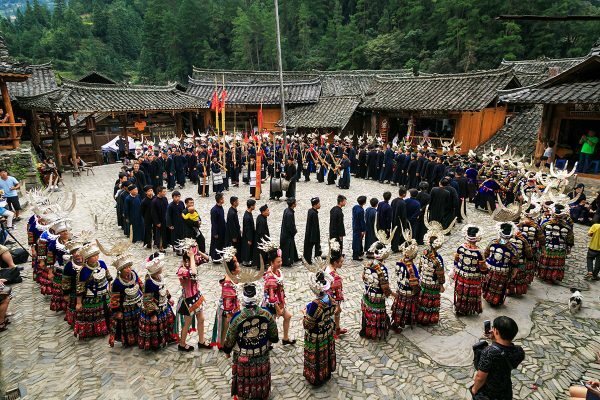 The guests are then led to the lusheng ground, where the men will play the lusheng and the young villagers will perform traditional dances. Eventually, all of the villagers will participate in the dance and the guests will be invited to join in! Imagine drinking the smooth wine, revelling in the traditional dance and then settling down at dusk, strolling around the quiet village and taking in the sultry air. We’re sure you’ll agree that Langdeshang is a truly magical place and definitely worth a visit. Mangtong: A Chinese wind instrument. It is composed of a bamboo pipe without finger holes that is fitted with a metal free reed and then placed in a larger bamboo resonator. They come in varying sizes, with the largest being up to 2 metres in length. One mangtong can only produce a single pitch, so normally several are played together.